Heat 4 tbsps olive oil in a frying pan and fry the onions and garlic until softened and starting to colour, 10-15 minutes. Add the wine, vinegar, herbs and spices and bring to a boil. 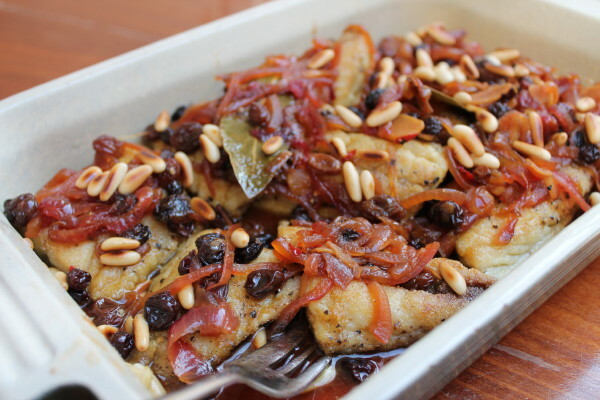 Add the olives and raisins and simmer gently for 5-10 mins, seasoning with salt and pepper. Set aside. In another frying pan heat the remaining olive oil. Pat the mackerel fillets dry if they are wet and season them well with salt and pepper. Dredge them in the polenta and fry (flesh side first) for a couple of mins each side until starting to colour. They don’t have to be quite cooked through. Lay the fish in a wide shallow dish and pour over the sauce. Chill overnight and then bring to room temperature before serving garnished with the parsley and pine nuts.